Jonathan Holmes' buzzer-beater from deep sends the Wildcats packing. AUSTIN, Texas — Jonathan Holmes delivered the shot. Cameron Ridley provided the muscle. Texas won again, this time 67-64 over No. 22 Kansas State and the Longhorns keep climbing upward in the Big 12. Holmes made a catch-and-shoot 3-pointer from the corner at the buzzer Tuesday night, sending Texas to its fourth straight league victory and second in a row over a ranked team. "I just caught it and shot it," Holmes said, adding he had no time to think before putting the ball in the air. The Longhorns (15-4, 4-2) are giving the Big 12 plenty to think about. A team that started with no expectations after a losing season in 2012-13, the program’s first in 15 years, is now feeling like it can chase the league heavyweights over a long season. And maybe even challenge for the title. "That’s what we’re playing for," Holmes said. Ridley scored 18 points in a game-long tug-of-war under the basket with Kansas State’s Thomas Gipson, who scored 24 points. Javan Felix had 23 points for the Longhorns, including two big baskets late that helped prevent the Wildcats from taking the lead. Holmes finished with 10 points, eight in the second half. Texas had almost blown its chance for the game-winner when the Longhorns nearly botched an inbounds pass with 3 seconds left. But after a quick timeout, Isaiah Taylor zipped the ball to the Holmes in the corner and he put up the shot over two defenders. The ball swished through the basket at the buzzer and Holmes was mobbed by his teammates. If Texas had run the play correctly the first time, Holmes was open for an easy layup. The longer, harder shot delivered the same result with a little more drama. The Longhorns were coming off a win over then-No. 8 Iowa State. Kansas State (14-5, 4-2) had tied the game at 64 on Shane Southwell’s twisting, off-balance layup with 5 seconds to play after Felix had missed two free throws that likely would have put the game out of reach. "(Holmes) could have easily (scored)," the first time, Kansas State coach Bruce Weber said. "That’s a big shot. They’re close to being a Top 25 team, too. It’s going to be like this all year in the league." The game was tight the entire way as Ridley and Gipson battled under the basket and neither team let the other build any kind of offensive momentum. The biggest lead was six points. The teams were tied or traded leads 12 times in the final 9 minutes. 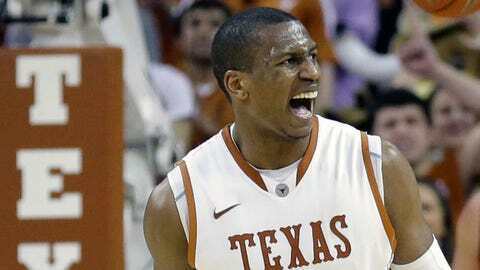 "We let them get us in a grinder a little bit," Texas coach Rick Barnes said. The Longhorns had a chance to push the lead to eight late in the first half before Ridley was whistled for an offensive foul. Gipson kept the Wildcats within four with a layup as time expired. Ridley picked up a second foul early in the second half and went to the bench for nearly 4 minutes. Gipson converted the three-point play and the Wildcats cut the lead to 40-39 when Gipson scored again. Ridley returned and quickly made a midrange jumper on his first touch, then denied Gipson a shot on the other end. "I shot every shot with confidence. They kept trusting me to throw it back to me," Ridley said. Kansas State grabbed the lead at 52-49 when Southwell made two free throws and Wesley Iwundu made a fastbreak layup. Felix briefly restored Texas’ lead with a baseline floater, his first points in nearly 6 minutes, before Southwell made a 3-pointer that started a flurry of back-and-forth lead changes and ties. Felix made two free throws to put Texas ahead 61-60 with just under 2 minutes left. Holmes made one of two before Felix made another off-balance baseline shot to make it 64-60. Southwell’s layup tied it before Texas got two chances to find the game-winner from Holmes. "You go on the road you and have a chance to grab a game, you have a chance to break their spirit," Weber said. "We didn’t do it."